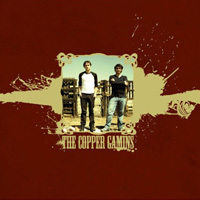 Copper Gamins: "The Copper Gamins"
On first listen to the latest EP by Austin rock and blues band The Copper Gamins, it would appear that the group took inspiration from Nashville duo The Black Keys, but with a lot less punch. The guitar and drums duo, made up of Jose Carmen on guitar and Claus Lafania on drums, hail from the Mexican towns of Metepec and Zinacantepec. The group began collaborating in their high school days and went on to play in bands that featured a mix of Latin and American rock tunes. After returning from college, Lafania got together with Carmen who had started playing guitar and formed The Copper Gamins. While the groups DIY (do it yourself) approach to writing music is to be admired, basically consisting of a few microphones and a mixer on a Teac reel-to-reel recorder, the effort sounds bland and rushed, which does not capture the blues rock sound the band was trying to embrace for the EP. The first track “Ruby Red” sounds like a Black Keys song that could have been from the band’s last album El Camino, with the guitar having a sound that sounds overblown, which is usually done when plugging a guitar into a tube amplifier and the drums acting as a human metronome. Hearkening to the band’s blues influences, the next track is a blues standard titled "Old Lady Sitting in the Dining Room (Traditional)," which leaves much to be desired. It seems like Carmen and Lafania did not care enough to make sure that the group knew how to play the song in time, making it sound like both members are struggling to keep up with one another. The next track, “Oh Girl,” is an original song with the vocals sounding so muffled that it’s hard to decipher the lyrics without referring to the liner notes. Along with muffled vocals, the drums tend to overpower the song, with Lafania keeping the beat with the crash cymbal, only to make it sound like he is trying to make as much noise as possible, and completely forgetting that a drummer must know how to keep the band from falling apart. “Candyman Blues,” originally performed by blues legend Mississippi John Hurt, sounds like the band did not take the time to polish the song to appeal to wide audiences, because the original version is blues music at its finest. The original version of the song, recorded in 1928, with just an acoustic guitar and vocals, is a light-hearted song that is enjoyable, and conjures up images of sitting on a porch in the southern United States sipping sweet tea. The version that The Copper Gamins recorded sounds sloppy and under-produced with vocals, drums, and guitar sounding muddy and unbalanced. Finally, the last song on the EP, Maxima clocks in at one minute, and is so awkwardly placed it sounds like it could have been a part of another song the band has composed. While I can see the band attracting fans due to their blues rock sound and for their efforts at sounding different from other bands in their genre, the band needs more time to flesh out songs for their next EP. If the band were to take better care to ensure quality and not quantity on their future releases, The Copper Gamins have the potential for success. Overall, this EP seemed to be put together hastily, and it seemed that time was of the essence in recording this EP. If The Copper Gamins make quality songs a priority for their next record, then they have the potential to have decent success with their music, but until then not much success can be gained from this self-titled EP.